Frances covered Lush’s Sandlewood Smugglers launch for us so well that we sent her out again. 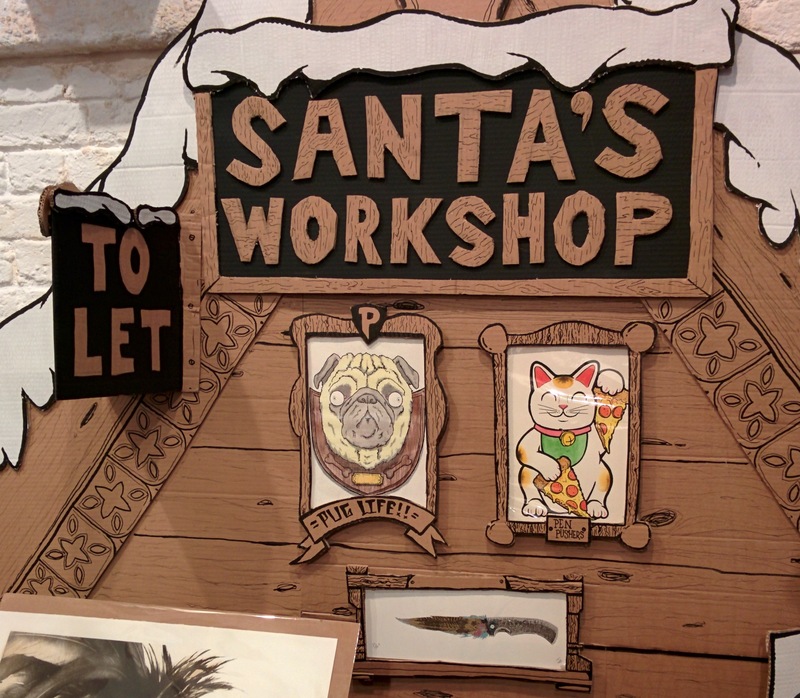 Do you have an indie comics, illustration, otherwise WWAC-friendly event coming up in London? Let us know! It’s bloody freezing in London at the moment, and the woodland animals of the city’s illustration scene are very sensibly wearing their warmest knitted attire. Adorning Christmas cards, badges and bunting, they also appear on limited edition prints (framed at extra cost). They may look cute, but with those little paws they’re secretly burrowing their way into your heart via your wallet, as you shell out for a picture of a pug in a scarf to accompany the 6 you’ve already got displayed in your living room, to console yourself over your landlord’s meanness in not allowing you to have pets in your tiny rented flat. 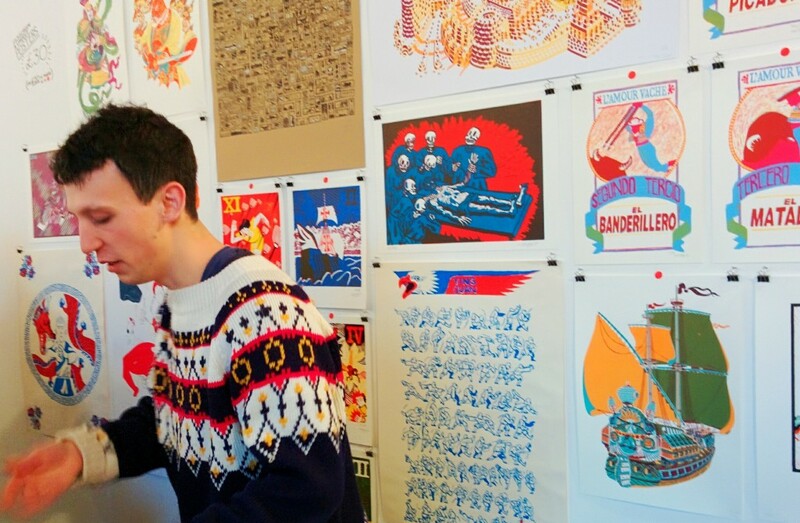 In keeping with the times, the London Illustration Fair had its fair share of animals, but to its credit the 15 featured artists showcased a wide range of inspiration, using technologies old and new. Dan Hilier cuts up Victorian engravings to create monstrous collages, with maiden aunts sprouting octopus tentacles and gentleman cyclists forced to dismount by beatific visions. 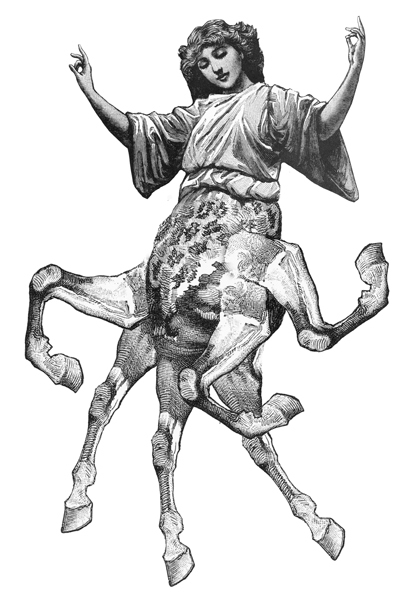 He works mainly with Photoshop and its layers and masks, touching up the creations with pen and ink. No digital mastery is used by Lucille Clerc, who draws her amazingly intricate works in pencil, before screenprinting the final works by hand. The buildings and places she depicts are at once recognisable and unnerving: the British Museum has its iconic columns and façade, but its treasures are spilling out of the front door and straddling the roof, like they’re unbound and reckless after centuries of being cooped up, archived and curated. 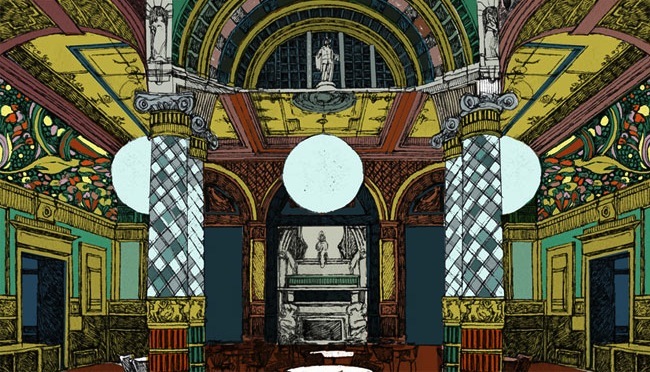 Her rendering of the Victoria & Albert Museum (excerpt below) is awash with Byzantine splendour, although presented with a degree of perspective that makes it seem otherworldly – it’s how you might remember it in a particularly vivid dream. 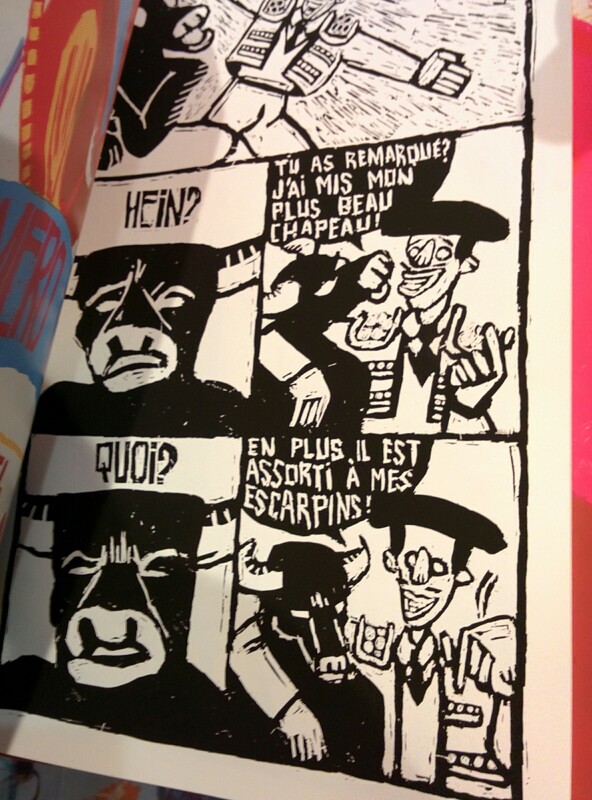 For me the highlight of the fair was Mathieu Zanellato, a self-publishing French artist who creates comics entirely from linocuts and traditional screenprinting processes in his studios in Strasbourg. 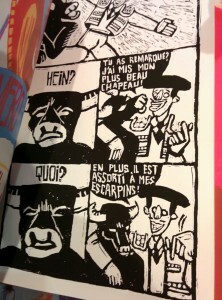 His comic L’Amour Vache is a love story between a stricken toreador and a bull who’s got other ideas – the title is typical French wordplay, as the expression I’m badly translating as “Cow Love” idiomatically means a “troubled relationship.” The toreador turns on his showman charm (“Look at my new hat, bull! It matches my shoes!”) but the beast is unimpressed. Mathieu described the underground comics culture in Strasbourg as thriving – the city on the German border is a hotbed of creativity, with comics festivals every year and a growing number of students. 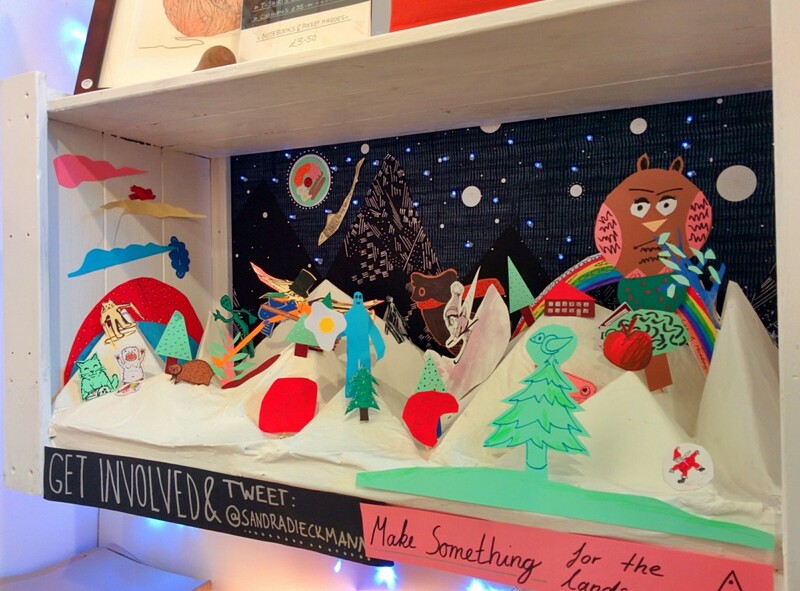 Sandra Dieckmann added a much appreciated participatory element to the fair, by encouraging everyone to get involved and make a contribution to a winter-themed DIY diorama – a mountain scene. We were given card and coloured pens. Guests’ conjured up an alpine scene of evergreen trees, abominable snowmen, skiing monsters and snow-covered houses. The issue of how you can afford studio space in London as an artist is a pertinent one at this type of event. Live/work spaces are highly sought-after — there’s a good many former warehouses in the capital which make for excellent art studio space, given their large windows and sheer amount of floor space, but over the past decade many have been made into luxury apartments for the super-rich. Many of the artists presenting at the fair got around this either by sharing space with other designers or by not living in the city at all, only coming into London for the occasional exhibition. With rents averaging £280 a week for a small, soulless apartment and many letting agencies only willing to engage with tenants earning over £26k a year, London is no longer a viable option for young artists starting out, unless you happen upon a good deal or are lucky enough to have family living nearby. 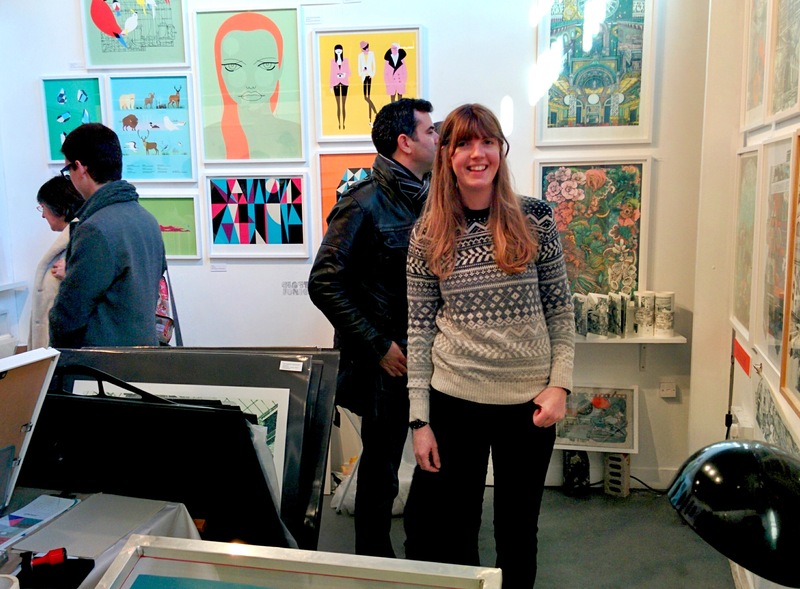 The crowd at London Illustration Fair are mainly trendy twenty-somethings. I saw fringes, handlebar moustaches and thick-rimmed glasses and heard a great deal of spoken French and Spanish. A mixture, overall, of career illustrators checking out other talent, those who dabble at the weekend and trendy office workers looking for affordable art. I saw cats riding Penny Farthings alongside pugs in party hats, I saw foxes sporting monocles while seals smoked cigars in dark oceans. Maybe this preoccupation with cutesy anthropomorphised animals in art is escapism from modern life, but I’d like to see work engaging more with the current climate and indeed artists from a greater variety of backgrounds: living in London is fast becoming a pipe dream for young people not working in banking, and this will have a devastating long-term effect upon the city’s creative output. For more information about the contributing artists, try here.